Terry Garrison has been in the accounting profession for over 46 years. In 1972 he began as an accounting clerk at Pet Dairy in Greenville, SC while completing courses in accounting, tax, business law, and economics. 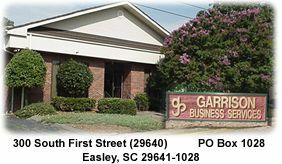 After obtaining his degree in 1973, he worked for Carbaugh & Jaynes Accountants in their Easley, SC office. In addition to accounting duties he prepared individual, corporate and partnership returns. After Mr. Jaynes' death in 1981 he purchased the assets of the company. To perserve the motto "large enough to service you and small enough to know you", we have a staff of five bookkeepers and three business management consultants and tax specialists to provide small businesses and individuals specialized services in meeting their financial needs in a prompt, professional manner.